Today I intended to ride as long and as far as I possibly could. 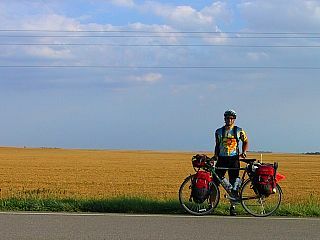 Bob and I both arose with the sun, quickly packed our camps, and had a full breakfast in town before hitting the road. I took the lead position in our "pack of two" and started setting the pace for the morning. I have to admit that my morning was fairly miserable. Because I was so fixated on making miles today my attention was completely focused on my GPS and cyclocomputer. I kept checking my speed, my position, and my miles over and over. I forced myself to ride at a pace that was a little faster than I was comfortable with and before long I found myself starting to ache all over. Although he perhaps doesn't have the endurance I do, Bob is probably the stronger cyclist and he cheerfully kept up with the pace I was setting, even commenting along the way what a great morning he was having. In Rush Center we stopped for our second breakfast of the day and for a brief rest. Over the meal I decided that even though I was going for miles I wasn't going to try to maintain a pace that would just burn me out before the day was done. Since Bob doesn't have the short-term time constraint that I do, he has no reason to make the miles I was striving for and had decided that Ness City ahead would be his stop for the day. As we rode out of Rush Center for the day, even at my more comfortable pace, I found myself slowly slipping further and further ahead of him until finally I didn't see him again. Along the way I passed some post rock fences, a type of construction that is peculiar to western Kansas. 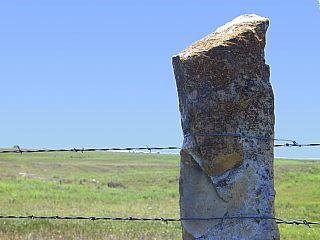 This part of the country is so devoid of trees that when farmers and ranchers needed to enclose their land in the 1880s, they used quarried limestone as posts to support barbed wire. These posts can weigh up to 450 pounds each, and a team of horses could only transport a few at a time. As I approached Ness City I began to struggle with a headwind coming out of the West. My speed fell from 12 mph to 10 mph, then from 10 mph to 7 mph, and I began to doubt my ability to go much further. From Ness City to my goal of Scott City would be another six hours of riding, and that put me right on the cusp of making it by sunset. Emotionally I was leaning towards throwing in the towel for the day. When I found that the motel in town charged twice what I was willing to pay and both restaurants were closed, I decided that fate didn't want me stopping here so I ate a late lunch assembled from gas-station food and headed on. In the small town of Dighton I once again had to decide whether or not to stop. I had two hours until sunset, two hours of riding ahead, and a hundred miles behind me. I found my motivation in the fact that if I made it to the Hostel ahead, a Jacuzzi waited for me. Loading up on my fourth meal of the day I headed out, fueled at this point primarily by caffeine, taurine, sucrose, and ibuprofen. When I finally saw the water towers of Scott City ahead of me I knew I had made it on my longest day yet. I had ridden for 125 miles without the aid of a tailwind. I had spent 12 hours in the saddle and probably burnt close to 7,200 calories getting here. The hostel was pure bliss. I had caught up with the three young men from Hutchinson, as well as with Steve and Linda whom I had last seen in Carbondale. The Jacuzzi was everything I could have hoped for, and I made it to the grocery store just in time to put together my fifth and final meal for the day. You will never guess who this is??? Someone from your past. I really enjoying your journal - Its hard to believe someone can ride a bicycle as far as you have. Yesterday, my grandson and I rode bikes for about 2 miles and because of a about a 10 degree incline we had to walk the bikes for about half of the 2 miles. I really enjoyed looking at you in all the pictures. I went through all of the journal entries. Nick, be careful and I know you will accomplish your goal of completing your journey. Your Mom talked to Barb and your grandmother last week and we found out about your website. I do not have a computer, but I will be following your journal when I am in San Jose visiting with your grandmother and your aunt Barbara. Have a great trip - I will try to keep track of how you're doing.